"The Framework presents a holistic view of 21st century teaching and learning that combines a discrete focus on 21st century student outcomes (a blending of specific skills, content knowledge, expertise and literacies) with innovative support systems to help students master the multi–dimensional abilities required of them in the 21st century. The key elements of 21st century learning are represented in the graphic and descriptions below. 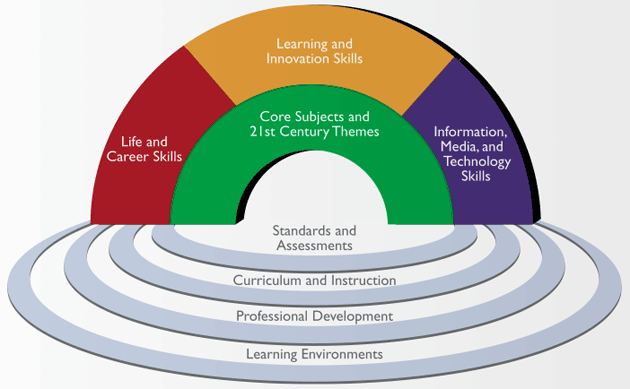 The graphic represents both 21st century skills student outcomes (as represented by the arches of the rainbow) and 21st century skills support systems (as represented by the pools at the bottom)."